On Sunday Auckland Transport roll out the new bus network for the North Shore which is the final major implementation of the network. It’s been a long and windy bus ride to get to this point with the first discussions of the network occurring all the way back in 2012. Below are some thoughts, both positive and negative of the network based on both the routes and the timetables. The Northern Busway has been one of the fastest growing and most successful public transport projects we’ve seen in Auckland in recent years and it’s about to get even better. The original NEX becomes the NX1 and becomes even more useful with a boost off/counter peak frequencies. Now, buses will run between Albany and Lower Albert St in each direction at a minimum of every 7-8 minutes throughout the day till around 8/8:30 before dropping back to every 10 minutes till almost midnight. Services will obviously run more frequently in the peak directions too. This is pleasing to see as counter peak services are now frequently heavily used with people struggling to get on services. Improving from every on average 10 to every 7.5 minutes might not seem like much on paper but does make a noticeable difference if you’re waiting for a bus. Peak time services from the Hibiscus Coast are also improved but frequencies remain low off peak. The 881 service becomes the NX2 and travels to the Universities via Wellesley St. Off/counter peak frequencies are also really strong on this route too with buses most of the day every 10 minutes or better and very frequent in the peaks. Given its access to the Universities and to a much greater employment catchment, I can see this service being very popular. The only thing that seems odd with these are some of the timings. For example, the timetable shows it taking 17 minutes for the NX1 to get from Akoranga to Britomart but that it will take only 18 minutes to get from Akoranga to Symonds St.
Takapuna is currently served by a myriad of buses that first travel down the eastern North Shore. My personal experience is that this has often led to unreliability. From Sunday, the 82 bus will serve Takapuna with most continuing on to Milford. Given the buses will only be travelling a short distance on local roads this should help make services much more reliable. In another positive move, peak time services in both directions are to get a much-needed boost with extra services starting or terminating at Takapuna to give a frequency of every seven to eight minutes. On a personal level this will make it much easier for me to get to work, and I’m sure plenty of others too. For the first time there will be bus services linking Warkworth to the rest of the region (via the Hibiscus Coast busway station) and there will also be services linking Warkworth to the local seaside communities east of there. The myriad of services currently on Onewa Rd make it one of the busiest corridors in the city and that will remain, largely unchanged, with the new network. One thing that did surprise me though is that the high frequency doesn’t extend till midnight like many of the frequent routes on the Isthmus are now doing. Perhaps the most obvious thing that stands out is that the western North Shore is largely isolated from the eastern side, especially on the lower North Shore. This is reminiscent of the network today. There are only a few services that cross the motorway divide and they don’t run frequently. This means it’s easier to get to Takapuna from the City than it is from Northcote even though the latter are only a few kilometres apart. The most obvious route to improve to achieve this would be the 941 from Beach Haven to Takapuna. 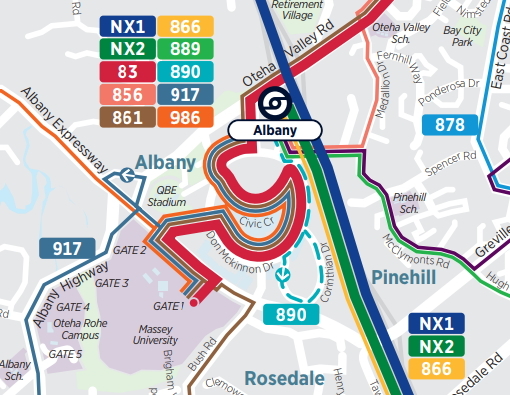 Likewise, a lot of the connections to the rest of the North Shore map could be solved, or at least made easier, if there was an Onewa Rd Busway station. What are your thoughts on the new North Shore network. A pity the new Warkworth buses don’t include bike racks. Wellington and Whangarei are now adding racks to their buses, which will leave Auckland and Hamilton as the only cities without racks. Yes. The ability to get to Point Wells and Omaha for a holiday is now much better, and cheaper. But with a bike or a bit of extra luggage, the regional bus will still appeal as far as Warkworth. Will the Intercity price go down due to the competition (I seriously doubt it) or up due to the lower passenger numbers reducing viability? Best get up there quick Heidi before it is under water. Time to get a folding bike John – much more convenient to pack it up into a little carry-on package, rather than stick your bike out on forks at the front of the bus and worry about it falling off on 50km worth of motorway travel everyday…. My bike’s been on lots of bus racks at up to 95kph and never fallen off. On one bumpy, windy route my electric bike swayed around a lot and I’ve taken its battery off since, but it stayed on. A folding bike john. Now there’s a novelty. Might be good value for freedom campers. Folding bikes are not for everyone, I am quite tall so even the biggest folding bike is very uncomfortable for me. 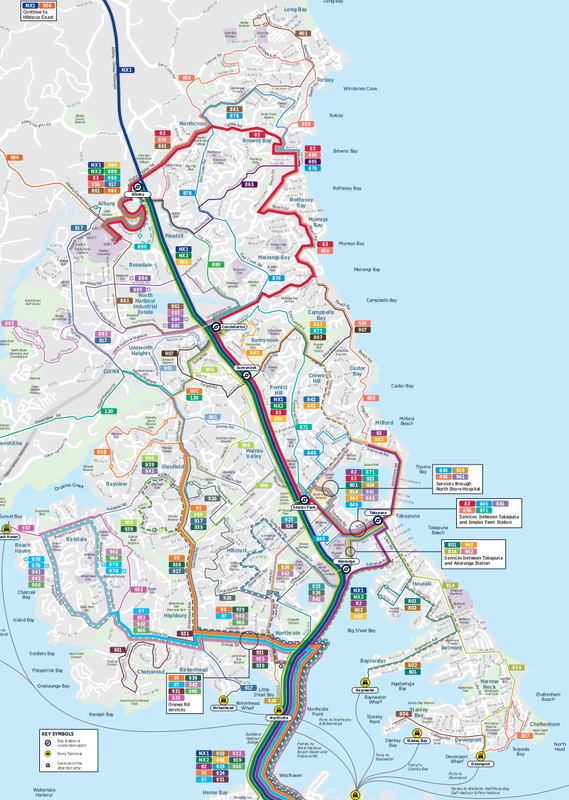 I don’t see why the 995/996/997 in the North, 122/125(non-express) in the West (and the future planned Piha and Huia buses), 739 in the East and 396, 398, 399 in the South couldn’t have bike racks, considering there aren’t a large amount of passengers, and having cycle ride-up and people trying to get their bike further out more safely/faster would increase patronage with no real downside (as there isn’t really the slowdown affect/capacity issues that the urban areas might suffer from). Any idea how Waiheke got them, when the rest of Auckland didn’t? More frequent NX1 and NX2 services could lead to bunching. I and others waited at Akoranga on one offpeak occasion for about 8 minutes, and then three NEXs arrived simultaneously. Even worse was an occasion when two arrived simultaneously. The first was full with passengers standing, but this was not obvious because of window tinting. A few got off, so a few people were able to board. By the time intending passengers realised that no more could board, the second bus, with about 8 passengers aboard, had dropped his passengers off and departed, oblivious to the people left stranded on the platform. My question is, knowing that a near empty bus was right behind him, should the first driver have shown the Full sign to alert the second driver. Seems to me like serious miscommunications like this can happen and I’d like to know whether AT has a policy directive to the contracted companies or whether this is something that the contracted operator can choose to do. The Howick and Eastern drivers used to get on the radio quite a lot and let the bus behind know that they were full. If they are effectively travelling as a train they need to function like a train and allow people to board where they want. Also if the tints are making it hard to see onboard they really should be removed or replaced with weaker tints, why make it harder for passengers? Agree the tints need to be removed. And all the advertising that makes it hard to see out. Plus, travelling at night isn’t nearly as fun because the lights stop you from being able to see out. I wonder if there’s a lighting design for buses that solves this – eg lights down low, with more that come on at stops, or something. I do like the really good lights that come on and light up outside the doors when they open. Yes lack of Onewa station is holding the whole north shore network back, but living downtown means I have much better access to parts of the shore now, as long as I am only going one place – will certainly negate the need to drive there in many situations. The 890 is an interesting one – grass all around Corinthian drive has been destroyed by cars parking on it in the last few years as employment in the area grows. AT (council?) recently started ticketing these cars and will now implement paid parking starting next week with the expectation that commuters will get the (new) bus. Hopefully it works well. 83 makes Browns Bay accessible too, which is appreciated – growing up on the shore and depending on the old routes (pre NEX) was painful, but pretty. Browns Bay has always had terrible access to the motorway and public transport, so a proper rapid route that works well might finally push it into a higher development mode – it’s actually a good size with lots of restaurants, stores etc, flat and near the beach and could make an amazing little urban enclave. The NX2 connecting Wynyard to midtown is also a big win, provides a lot more option for the large population base at the south end of the city centre! The noted timings you question might assume the Wellesley street busway improvements? i hope AT is monitoring the parking situation on Corinthian Drive and will report on it. It’s the sort of data (like the feeder buses improving Otahuhu Station’s boarding numbers) that would be incredibly useful in community conversations when change is being asked for. Heidi, there is an irony about Corinthian Drive and that is that AT had an office there for quite some time. During that period drivers were able to park wherever they liked including verges and reserve land. What has changed? Throughout that period there was a bus service that went past the bottom of the road (could have been the 891) I am constantly amazed that AT allows free commuter parking to the detriment of public transport services. Who are bus companies who are running the new routes? I have noticed Birkenhead Transport investing heavily in additional buses and advertising for drivers. And of minor interest they have added a stop (possibly more) on the new 97 route now spacing about 150-200 metres in places on Waipa St and Mokoia Rds. Not sure why unless its to slow things down! Seriously? Running all buses through Highbury is insane, not unless the opposite of rapid transport is the objective. The less than 20 km/hr dawdle through that 760 metres of road via 6 pedestrian crossing tables is so so frustrating, just so the bus can make it to the stop at the far end of the centre. AT have no idea do they! Crazy. I imagine the shop owners would be quite happy to see the buses gone as well as they could replace the bus stops with more parking. They do have ideas – it’s just that they’re different ideas to your ideas! In this case, I assume that the routing is to ensure simplicity of the route structure by having just one “variation”, instead of having some travel by one route and others by another. Or, in practice, two existing variations given that buses go both clockwise and anticlockwise through Beach Haven and Birkdale. So allowing some buses to avoid Highbury would lead to potentially four route variations – complicated and against the New Network philosophy of creating legibility through simplicity. Having said that, it does seem to me that once you reach a certain threshold of frequency, then additional peak-time frequencies could be express buses which miss out Highbury. As they do in some other parts of the New Network. All of the 97 buses should bypass the Highbury shops, this meandering route can be left to the 933 and 942. Time to build a bus station on the bypass and pedestrianise Mokoia Rd from Highbury roundabout to at least the mall, and a good, shallow gradient pedestrian route from the bus station to the town centre to avoid getting run down by all the driver-thru takeaway traffic. Encouraging PT use is paramount and cutting down really unnecessary transit time is a no brainer. Minutes are taken up crawling and stopping for maneuvering cars and people through those shops for what is really just one stop of any significance 100 metres from the Onewa Rd intersection. Its been discussed here before but the shopping centre can be well served by buses stopping on Onewa or Mokoia Rd at the bypass. I agree with others, the 97 buses need to bypass it. My ideas are actually from using the buses and getting a bus that avoids the Highbury shops saves a lot of time. AT seems to be concerned about what suits AT’s agenda, not the passengers. This is a tricky one. A stop on the bypass will be 10 to 20 metres lower than Mokoia Road. The current stops are quite far from the town centre. Some shops would be 500m away from the nearest stop. You had better be young and fit if you want to take the bus to the shops. Well if the local community pages on FB are to be believed the Highbury KFC is a health hazard and should be closed. That plaza could be made a bus station at the with a little sorting of the traffic light sequence. It’s at the right level and a cut through the mall takes you to half way down Mokoia Rd shops in the dry at a fraction of the distance by street. roeland – how many people take the bus to the shops? There are hundreds of people every day who are inconvenienced by this dogleg, as I mentioned above the 933 and 942 could be left to meander through the shops. Is this commuters before people on errands. Gender issues? I think Andy’s got the right idea. Heidi – it’s more majority v minority. If I’m wrong and there are just as many people heading there to shop as there are travelling through, then I stand corrected and the frequent bus should continue to take this slow dogleg. It appears to be one of those situations that the bus goes that way because it has always gone that way, not because it is sensible. I don’t know how many people actually do that. I thought Birkenhead is a main anchor on that bus line. Maybe someone with HOP data can tell. I guess most people going to Birkenhead take the car. If buses only stop some distance away that balance will go even more towards the car. If the problem is cars manoeuvring in and out of parking, then the solution could be removing some of that parking. Maybe going over the bypass can work as well but it’s currently a pretty bleak spot for getting off the bus. And as any cyclist can tell you, that bypass goes down quite a bit so you’ll always have the problem of that walk up and down the ridge. Is there a shrine in the town square? 🙂 We know what it would be to. If you use the web based AT Journey Planner you can click on each leg of the journey and see which company run that section. Future date the journey of course. -NX2 service reduces dynamically at night. -The lack of NEX northcote bus interchange that transfer between Birkenhead really pays the price now. 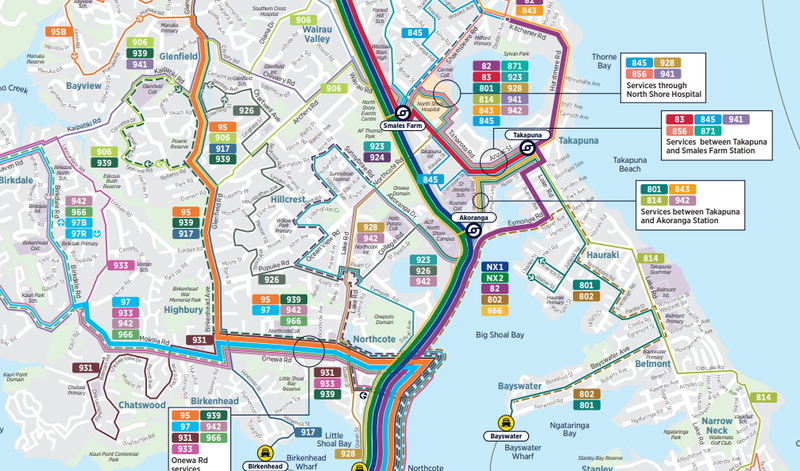 Takapuna is indeed a mess: I seriously wondered (and had to count) whether there are more bus routes that use Anzac Street (Takapuna) or the Harbour Bridge in the new network (Anzac Street wins if you exclude the peak-only services over the bridge). I also believe Anzac Street has more bus routes in the new network than in the old network. Seems as if the problem is AT’s hesitancy to connect Takapuna with the busway using connector services (every bus to/through Takapuna must continue on to either Smales or Akoranga). I know this blog hates circular link services, but I’m surprised a Takapuna Link wasn’t considered that would run frequently Akoranga -> Smales -> NS Hospital -> Takapuna CBD -> Akoranga. The new network isn’t set in concrete forever and the THAB hasn’t actually been built yet so I can’t imagine it is too much of a problem. There’s plenty of construction already going on there. If there is meaningful access to PT then maybe there will be less pressure to cram parking into every square metre between buildings. I agree, Roeland. Research shows that it’s far harder to shift people from driving to PT if the parking was provided initially than if it wasn’t. The PT needs to be there to allow the development to have low parking provision so that it’s not hard for people to switch later. This new network looks pretty good to me considering lack of Onewa Rd Busway station & the geography of the coastal beach areas. One thing I noticed with a quick check the other day is if you compare the current NEX timetable (probably in Journey Planners is best) with the NX1/NX2 is the times are padded more. Does anyone know if this would be more realistic times based on their experience of it in reality or are they overly padding this? I only occasionally use the North Shore services. Grant, I agree with you that the new network looks reasonably good. Gone are some of the buses that traveled a long way when feeder buses to the central spine – the busway makes more sense and allows frequency to be improved. I am sure that more can be done in this area, someone has already mentioned night services, but it had to start somewhere. Maybe there exists a funding structure that would not allow AT to get in the way of building light rail, infrastructure that would be life style enhancing and environmentally helpful for all of the Shore? The old map looked like someone had thrown spaghetti at a wall. So does the new map. The North Shore is definitely the weakest of all the network redesigns. It will make a lot more sense if you draw relief shading under that map. A few areas (around Browns Bay and around Birkdale) are really hilly, and those hills dictate the street network. We’ll have a fun experiment soon: can Wellesley Street handle the NX2? I was expecting some infrastructure upgrades to handle such a frequent bus service, presumably with double-decker buses using the Wellesley corridor for the first time. The bus lanes on the steep hill between Hobson St and Sale St are prone to potholes/slumping/erosion with the current bus loads (there’s currently a maze of potholes between Hobson and Nelson westbound). It won’t be long before the eastbound lane suffers the same fate with heavier buses queuing up the steep hill waiting for the Nelson Street lights (which are timed to prioritise Nelson Street traffic). Also, any chance that AT is looking at prioritising bus left turns from Halsey Street on to Fanshawe in the PM peak? That block of Halsey street backs up badly from 4-6pm and it can take up to 15 minutes for a Wellesley-routed bus to get around Victoria Park. Seems like a no-brainer to make that a left-turn only for buses in the PM peak (private vehicles heading to the Shore either use Victoria/Beaumont or go via Wynyard Qtr.). Maybe the NX2 will reduce the number of buses, but the law of induced demand will just mean private cars looking for the quickest way on the motorway will fill up any free-flow. We are in the unfortunate position of getting dramatically less service from the new network. We currently use the 945 to go directly to Takapuna and the 945X to go to the city which is every 15 minutes during peak. The new service leaves us with only the 906 feeder to Smales Farm every half an hour. The 926 to Akoranga would take 30 minutes just to complete it’s route so that’s not an option. It’s a 10-15 minute walk uphill to Glenfield Rd for the services along there or a 10-15 minute walk to the 941. Not great when every minute counts in the mornings. If they could increase the 906 to every 15 minutes during peak it would help, but we will still miss the convenience of the 945X. Does taking then 906 to the top of Coronation Rd and then walking out to Glenfield Rd to get a 95 bus or 926 to somewhere in Northcote to transfer to 924/3 work? Definitely looks like there is some issues with Marlborough/Hillcrest to city now that there is no direct peak service..
That still requires two busses with the feeder (906) only available every half hour… so no different. At least heading to Smales is direct and the NEX is frequent. The big issue is the frequency of the 906.